On Thursday, February 4, 2010 at 6 pm the Nuova Galleria Campo dei Fiori will inaugurate the second part of its exhibit dedicated to Giovanni Guerrini (Imola 1887 - Rome 1972). This exhibit focuses on Guerrini the architect and his work of masterful decorations for the Esposizione Universale (E42), meant to be held in Rome in 1942 to celebrate the 20th anniversary of the March on Rome (1922). The event was cancelled, however, because of WWII. Giovanni Guerrini - one of the greatest Italian figures of applied arts between the two world wars - was born in Imola on May 29, 1887. He attended the Tommaso Minardi Design School of Faenza and later the Art Institute of Florence. In 1913, in Rome, Guerrini took part in the Prima Secessione exhibit. Subsequently, his work was shown at top exhibitions such as 11 Venice Biennales, the Rome Biennale (1921, 1923, 1925), the Rome Quadriennale and the first Mostra del Novecento Italiano in Milan (1926). In 1927, Guerrini moved to Rome and that same year was chosen to be artistic director of ENAPI, the national association of artisans and small industries. In 1938, he and fellow architects Bruno La Padula and Mario Romano designed the Palazzo della Civiltà Italiana in EUR (Rome), which to this day remains Guerrini's most celebrated architectural work. In 1941, along with Achille Capizzano, Franco Gentilini and Giorgio Quaroni, Guerrini was selected to design the mosaics (circa 3,000 square metres) for the main hall of the Palazzo dei Congressi in EUR. In 1939 he created six large, black, monochrome mosaics for the Palazzo degli Uffici Fountain. The other 12 were conceived by Gino Severini and Giulio Rosso. Giovanni Guerrini died in Rome on March 20, 1972. Approximately 40 works will be shown in this second exhibit, including about 15 original drafts for the Palazzo della Civiltà Italiana, dated circa 1937; six sketches for the mosaics of the Palazzo degli Uffici Fountain (c. 1939); and another 15 preparatory drawings for the mosaics, which were never realised, for the main hall of the Palazzo dei Congressi in EUR (c. 1941). 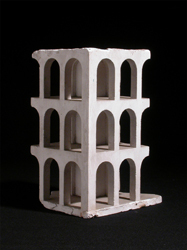 The show furthermore includes a plaster model of the Palazzo della Civiltà Italiana (c. 1938). Thursday, October 21st 2010 at the Nuova Galleria Campo dei Fiori opens an exhibit dedicated to Giacomo Balla (Turin 1871 – Rome 1958), curated by Lela Djokic and Daina Maja Titonel. In 1895 a young Balla arrives to the capital of united Italy, and discovers Rome's tucked away corners which tell quite a more colourful and boisterous story than the one engulfed in mist from his native Turin. He is captivated, so much, that in 1901 he dedicates a series of six works to characters at the forestage of the street, five of which are included in the exhibit. Yet the wandering vendors that offer fresh ricotta, cornetti, brooms and comforters, bay sticks and lucky charms, are not the protagonists of a social column depicted with amused complacency. It's the enthusiasm of having discovered a new world that dictates the expressive style that the artist offers, moving past the late eighteen century models, and manifesting the talent of his modernity. Balla paints streets, corners of walls and shops. He isolates his figures pulling them out from the crowd that would have attributed to the scene a charicaturistic feel. The paint stroke is free and simple, and reminds us some spasmodic self-portraits to come. The characters move to the rhythm of spirited gesticulation that gives life to a dynamic imagery, one that lives also in the shop sign which appears next to the Bottega del macellaro; a style that foreshadows Balla's personal exploration of movement during the Futurist movement. What also stands out is the novelty of the photographic composition. The figures are defined within a large setting composed of paving of the street, delimited by a horizontal line which is notably raised. In the background the shops are aligned, framed such as their tops are cut off. Just as in the famous paiting Il Fallimento (1902), finding here a suggestive foreshadowing of the doors of the shop that serves as a backgournd to Venditore di cornetti. Giacomo Balla's audacious innovation is, however, still more surprisingly attested by the juxtaposition of images and graphic elements. In exploring the bidimensionality of the scene, the artist writes on the lower of three boards the phrases called out by the vendors. He does this with a linguistic verism that leads him to multiply the vocals ("ricooootta freeeesca"), just as if to reproduce the voices of the characters. It's a sound which accompanies and completes the pictoral representation. Only the extraordinary creativity of Giacomo Balla could introduce into these canvases the magic of painted voices.